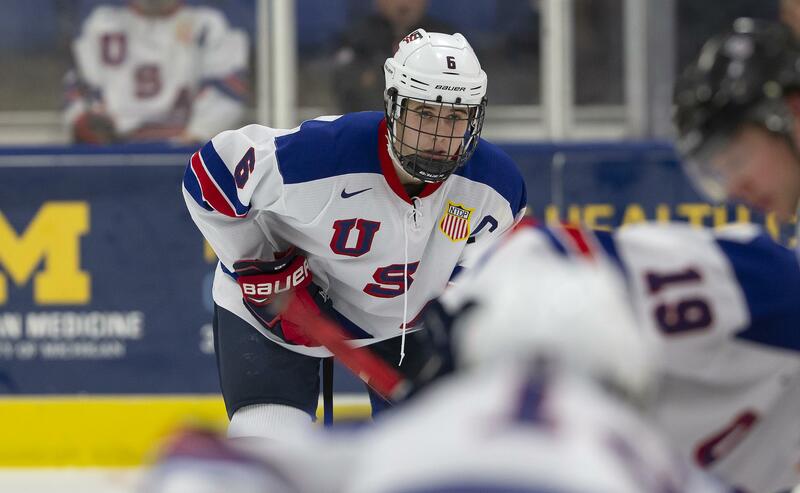 KRAVAŘE, Czech Republic – Jack Hughes (Orlando, Fla.) recorded a hat trick and registered two assists for the U.S. National Under-18 Team in its 5-2 victory against the Czech Republic in its second matchup of the Under-18 Five Nations Tournament at Buly Arena. Team USA is now 2-0-0-0 in the tournament and sits firmly atop the leaderboard. Team USA outshot the Czech Republic, 10-4, in the first period. Hughes figured in both goals scored in the first period to give Team USA a 2-0 lead after twenty minutes. He took a pass from defenseman Domenick Fensore (Thornwood, N.Y.) in neutral territory, skated to the high slot and beat Czech Republic goaltender Lukáš Pařík with the shot at 5:31 for his third goal of the tournament. Hughes started the play that led to the second USA goal less than a minute later, carrying the puck to the left goal line in the Czech Republic end, then fed it across to defenseman Drew Helleson (Farmington, Minn.) at the lower rim of the right circle. Helleson fed the puck back to Cole Caufield (Stevens Point, Wis.), stationed just outside the left post, who made no mistake with the shot at 6:18. The goal is Caufield’s third of the tournament and Hughes’ sixth point of the tournament. Team USA goaltender Cameron Rowe (Wilmette, Ill.) was tested once in the first period, making an excellent save through traffic on Radek Múzik’s shot from the right circle. Although the U18s outshot the Czech Republic, 16-7, and carried the play throughout the second period, the Czech Republic cut the Team USA lead to 2-1 at 2:58 when Jonáś Peterek snapped a shot from the right circle past Rowe. Rowe made an excellent glove save on Jan Bernovský’s blast from the left circle at the six-minute mark. Hughes scored twice in 34-seconds to extend Team USA’s lead to 4-1, working his way through traffic in the Czech Republic zone and tucking a backhand inside the right post at 10:26, then scored his hat trick goal at 11:00. Trailing, 4-2, with a little more than two minutes remaining, the Czech Republic pulled goaltender Pařík for the extra attacker, but Trevor Zegras (Bedford, N.Y.) scored with a long shot from his own zone into the empty net at 17:43. Team USA outshot the Czech Republic, 37-17 in the game. Rowe stopped 15-of-17 shots. The U.S. will face Switzerland tomorrow at 3p.m./9 a.m. (local/ET).